Freehanding the Dark Angels first company Deathwing symbol is not hard to do. At first glance it looks like a fairly complex image, but once you know how to break it down into steps, it's actually quite easy to paint. 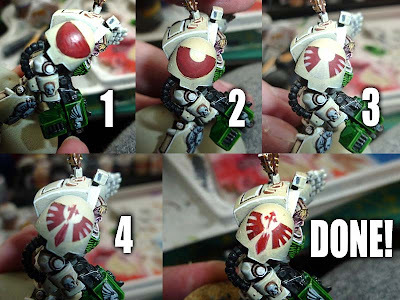 These pictures from fellow hobbyist Adam show you how he was able to take the process I posted a while back and use it on his own Deathwing models. The end result looks great. Freehand iconography holds a special place in my heart. Sure, I can make my own decals now and I often sculpt symbols in place now that I know how to cast shoulderpads, but there's just something cool about nicely done freehand work. It shows a level of dedication to me. It says you're willing to invest a considerable amount of time in a very small area of your model in order to explain to me where it comes from. A big thanks to Adam for sharing his work with me and I'm glad he was able to take something from the site and put it to good use. Since I've freehanded the design a number of times myself, I thought I'd find the symbol and create a decal sheet for those who would rather go that route. It fits a regular 8.5 by 11 inch sheet of paper and has a scale on it for other size paper as well. All you really need to do is save it to your desktop, test print it once to make sure you're all set and then repeat the process using your decal paper. NOTE: These should be printed on clear paper. Download the decal sheet here. 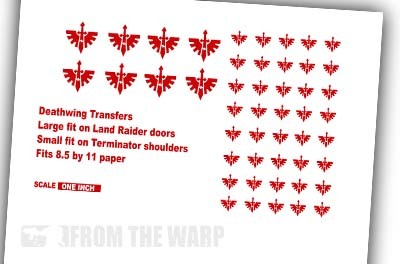 It's a simple jpeg image and includes enough shoulderpad symbols for 40 Terminators and 8 larger symbols you can use on Land Raider doors. Another great freehand article. Given I am about to embark on a Deathwing project (well, it's in the list), this is a gem. Adam: Maybe this will help you then. You've got plenty of options when it comes to marking your guys now... or when you get to it on your list. Ron, you might want to watch out on giving away the decal sheets for the Deathwing. Last I checked, Forge World is actually selling Dark Angel decal packs that have a large number of Deathwing symbols. Still, very cool and a great tutorial! I love the idea of doing freehand symbols instead of decals, but as a salamanders player that drake head is pretty intimidating. any thoughts on how I should break it down? Grysh: Let me look it over and see how I can break it down into manageable pieces. Well this needs bookmarking as its been decided, deathwing belial army for throne of skulls at Warhammer world in october! 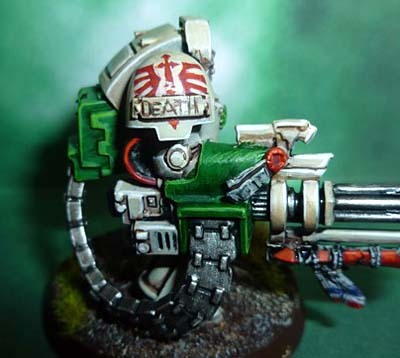 I love these freehand articles, they inspired me to have a go at my own chapter badge by freehand something I wouldn't have known how to attempt before. rob82: You've got it perfect in your posts there. And the result is great looking too. Consistent across all the models and they look great.